1st stage entries are now being accepted for the 12th ICCF Veterans' World Cup which is open to those players who were born on or before 1st September 1959. This event is being organised for the fifth consecutive year by the EFCC, with our President, SIM Ian M Pheby, being the tournament organiser. Entries must be made under 'New events' on the ICCF server by either ICCF Direct Entry or via the EFCC as your National Federation. If you wish to enter via your National Federation, please pay the entry fee of £9 via PayPal on the left-hand side of this page using 'VWC12' as the reference. The deadline for submitting entries is 1st August 2019. England v Netherlands Friendly Match - Do you wish to play? We are organising a friendly match against the Netherlands and are looking for 50-60 players willing to take part. It will be just two games for each player (one white, one black) against one opponent in the usual manner of friendly matches. The games will be played on the ICCF webserver with a time control of 10 moves in 50 days. Scheduled start time 31 May 2019. So, do you wish to be considered to play? If yes, please contact Neil Limbert (Email Neil here) by April 25 at the latest. Thank you. If we are over-subscribed, we will match players as close as we can on ratings (using the 2/2019 rating list) and omit other players. So please be aware I cannot guarantee you will definitely play at this stage. But we should be able to accomodate most players. The British CC Team Championship 2017 is now complete. Congratulations to Y Dreigiau Cymreig who finished in first place with a score of 11 points from 16 games. BCCA Capablanca finished second with 10 points, and BCCA Alekhine finished third on 9 points. Both Y Dreigiau Cymreig and BCCA Capablanca were unbeaten. My thanks to Ben A. Wood who acted as the Tournament Director. View the updated BCCC rules here. EFCC have just been advised on the very sad news that Senior International Master Mike Nicholson died in the early months of 2018 at the age of 79. Mike played international CC for almost 30 years from 1986 to 2015. He represented England five times in important Team tournaments (one Olympiad, three European Team Championships and one North Atlantic Team Tournament) and always fought hard. In particular, his performance in the 16th Olympiad Preliminaries (2005-2009) was exceptional, as can be seen from this crosstable: https://www.iccf.com/event?id=8084. He was awarded the International Master Title in 2007, and the Senior International Master Title in 2008. He will be sadly missed. Rest in peace. The 2nd English Correspondence Chess Championship has started! 57 players entered the tournament of which 23 hold Titles (6 SIM, 1 LGM, 2 IM, 7 CCM, 7 CCE). A Championship final, 2 semi-finals and two preliminary groups are being contested. The average rating in the Championship final is 2394 with each player holding a Title. Good luck to everyone in these tournaments. English player Steven Cade has been awarded the ICCF International Master (IM) Title following superb performances in the 7th Welsh Invitational and a Master Norm tournament. 1st place and English Champion: CCM Mark Eldridge 8½/14. Both Mark and David had the same number of wins but Mark had the better SB. 2nd place: CCM David Evans, 8½/14. 3rd place: SIM John D. Rhodes, 8/14. 1st place: CCE Michael J. Blake, 7/10. 2nd place: Robert J. Wakefield, 6½/10. 1st place: CCM Brian Thompson, 7/10. Both players had the same number of wins but Brian had the better SB. 2nd place: CCE Richard Williams, 7/10. 1st place: Gregory Hughes, 8½/10. Both players had the same number of wins but Gregory had the better SB. 2nd place: Robert Marks, 8½/10. 1st place: Terence Donovan, 9/10. 2nd place: Trevor S. Brotherton, 8/10. 1st place: Allan Gardner, 9/10. 2nd place: Phil J. Brooks, 8½/10. Congratulations to all the successful players, and I hope that everyone enjoyed their games. There is still time for players who are registered or able (in the case of new players) to be registered to play under the England flag in the ICCF to enter the 2nd English Championship. The closing date for entries is 1st February 2019. Details may be found on this website. I am pleased to announce that the Peter H Clarke Memorial is now complete. Congratulations to Brian Thompson (ENG) for winning this Category 6 tournament and for gaining an IM and a SIM Norm, Jerry E. C. Asquith (ENG) for finishing in second place, and Kyle Biedermann (USA) for finishing in third place and for gaining an IM Norm. EFCC has a new Treasurer from 1/1/2019 - Dave Grobler! Congratulations to Dave & we hope he has a long & happy stay in the role. We would also like to express our thanks to outgoing Treasurer Toni Halliwell who did a fantastic job for us over several years. We would remind all players that EFCC is run by volunteers only who give up their time for free to help you enjoy your chess. We are looking for new volunteers to join the Executive Committee so if you feel you can give a little of your time, please contact Neil Limbert (Email Neil here) for further details. It is important that the nominated players fulfill the requested elo rating on the list 2019/2. If the elo of a nominated player is reduced in the time between the nomination and the start of the tournament it may be that this player is moved to a tournament with a lower average category. If you are interested in playing, please contact Neil Limbert (Email Neil here) before the end of December. If more than one player is interested in a particular section, the EFCC Selection Committee will decide which player to put forward. Announcement for the 2nd English CC Championship! The English Federation of Correspondence Chess (EFCC) is pleased to announce that the second English Correspondence Chess Championship (ECCC) will be held which will start in March 2019. All English players are invited to enter England’s premier tournament! The entry fee is still £9.00. However, entry is free to all eligible players with an ICCF rating of 2500 or over or who are ICCF Grandmasters! The prize fund has been significantly increased this year! The Champion will receive a cheque for £300 together with an engraved trophy to retain. Monetary prizes will also be available to those finishing in second, third and fourth places of the Championship, and also for the first two places in the semi-final sections. There shall be a Championship final, semi-finals & preliminary sections with all standards of player catered for. The games will be played on the ICCF webserver, and the tournament duration shall be approximately 22 months of playing time. The time limit shall be 40 days for each 10 moves. Entries may be made by PayPal through the 'Online Fee Payment' section on the left hand side of this web page quoting “2nd ECCC”. Alternatively, entries may be sent to the Tournament Organiser, Ian M Pheby (address: Oaklea Cottage, Horsham Road, Capel, Dorking, Surrey RH5 5JH) with a cheque for £9.00 made payable to “EFCC”. Free entries by eligible players with an ICCF rating of 2500 or over or who are ICCF Grandmasters should be made by notifying Ian M Pheby by email. The closing date for entries is 1st February 2019. Pairings will be issued as soon as possible after that date. All English chess players are heartily invited to enter this tournament, both for the enjoyment of the games and for friendly contact/communication. There will be ICCF Norms available on most boards. No entry fee to players. So, if you wish to be considered for the team, please contact Neil Limbert within the next seven days! If we are over-subscribed, the Selection Committee will decide and the other players placed as Reserves. Earlier this year, English team, ICCF Warriors won the British Webserver Team Tournament 1st division for the third consecutive season. The winning team was SIM Olli Ylonen (FIN), LGM Toni Halliwell, LGM Natalia Litvinenko (KAZ) and EFCC President SIM Ian Pheby. This is quite an achievement given the strength of the other teams over the past three seasons. Pictured below is LGM Natalia Litvinenko, from Kazakhstan, receiving her trophy from team captain SIM Andrew Dearnley. I am pleased to announce that GM Nigel Robson has finished fifth out of seventeen competitors in World Championship 29 Final. He remained unbeaten in this Category 13 tournament. Congratulations to Nigel on a fine performance. England have been challenged to a friendly match against the Rest of Europe (after earlier in the year we defeated a strong Russian team) and we really need every English player to turn out for the team & play! This is going to be some challenge, the likes of which England has never seen before! It’s going to be approximately 100-120 boards and a very special one off rated friendly match. All rating strengths will be catered for. Each English player who agrees to play will be paired with a similar rated player from a European country and play just two games (one with white, one with black). This unique match will start on 1st November 2018 and will use a time control of 10 moves in 40 days. So, we appeal to all English players: will you play in the team please? Andrew Dearnley will be the Team Captain. Your support in playing for England in this match would very much be appreciated. Delegate Neil Limbert collects the English titles awards at the recent ICCF Congress. England’s Gary Maguire was presented with his CCE & CCM titles at the ICCF Congress awards ceremony. The final day of Congress (Day 3) commenced 9am. The day started with a discussion regarding the EFCC proposals for the Veterans World Cup. Wales (R Sherwood) & the QC (Uwe Staroske) spoke vehemently against them all. The votes were close but we lost them all by 21 – 17. Proposal’s 31 & 32 & 38 passed comfortably. Proposal 35 passed so postal players will now play 10/40 internationally. Proposal 42 initiated a substantial discussion but it eventually failed 8 – 24 with 25 abst. Proposal 43 concerned increasing the speed of play in Veterans World Cup. After debate, this was defeated 12 – 23 with 22 abst. Proposal 44 passed easily so ICCF now has its own laws of correspondence chess. The following reports were presented & accepted: Tournament Director Committee Report; Appeals Committees, Arbitration Committee. It is interesting to note that the chair of the Arbitration Committee regards ETL’s (players losing games on time by allowing their clock to run out instead of resigning) is a serious behavioral issue & needs to be clamped down on. The Zonal Directors presented their reports and their ideas going forward. Slight changes to the Statutes were agreed. However, proposals 11 & 12 were rejected. Proposal 13 withdrawn because Congress debate identified inconsistencies in the proposal. Proposal 14 was passed to combine Appeals Committees. There then followed discussions & proposals regarding Voting rights. This may be a drab subject for many people but these proposals were fiercely debated! Proposal 5 was passed by only one vote by 20 – 19 with 18 abst. EFCC voted against as this is another blow to the power of National Federations. Then Proposal 7 failed narrowly by 3 votes 18 – 21 with 18 abst. Proposal 37A was passed after considerable debate 30 – 9 with 18 abst. EFCC voted against because we do not believe that Voting Regulations should take priority over Statutes. Proposal 37B & 37C & 37D were passed comfortably, despite the votes against by EFCC. This effectively reverses the previous decisions of Congress. Democracy is the loser as a result of these votes. Proposals 39 & 40 withdrawn after the proposer (Dutch delegate) was put under intense pressure by various ICCF officers & officials – unfair pressure in my opinion. The final proposal was to host the 2019 Congress in Vilnius Lithuania 18-22 August 2019. Agreed. Day 2 was a long day! Commenced 9am. Financial regulations (entry fees, rebates etc) presented by FD. Report by DE Commissioner accepted. Proposal 41 failed (13 – 20 with 24 abst) – because most people agreed that it was a not a problem: TO’s will refer Federation nominations anyway. Services Director presented his report which included projected improvements/changes to the server for the coming year. He requested a budget of 20000 Euros (proposal 015) passed 37 – 2 with 18 Abst. EFCC abstained because no cost estimates were supplied. The Qualifications Commissioner presented his report – 744 Titles awarded last year. Proposal 20 was passed (29 – 7 with 21 abst) after debate. So Federations will be given CCE/CCM medals at Congress each year just like all other Titles. Until now, EFCC have paid for these medals, so now ICCF will pay. Proposal 47 passed 40 – 0 with 17 abst. The Ratings Commissioner presented his Report. His working group looking into the Glicko rating system (as a replacement for ELO rating) and decided not to proceed. The Ratings Commissioner intends to resign next year after 25 years in the role. The Marketing Director then presented his report. Also, the report of the World Tournament Director was presented & all invitation tournaments approved in retrospect. The report of the Title Tournaments Commissioner. Concern was expressed about the delay to the next Olympiad final – why wait for the full 4 years if the finalists are known? Will be referred back to the Commissioner. The NTTC Report was presented. Proposal 045 passed 23 – 16 with 18 abst. So the Veterans World Cup will switch from annually to bi-annually from 2020. The full World Cup, the Veterans World Cup & the Webserver Opens will move to a regulated start dates. The ICCF Calendar of Events will need to be amended in due course. Champions League will move to Triple Block from the season after next. There will be a D Division next time for lower-rated teams. The following reports were received & accepted: Aspirer tournament report, Postal tournament report, Chess 960 report, Thematic tournament report, Interzonal tournaments report. The afternoon session was devoted to the report of the Rules Commissioner and the numerous proposals connected to that report or within that field. Proposal 001 passed 39 – 1 with 17 abst. Proposal 002 passed 39 – 2 with 16 abst. Proposal 003 passed 37 – 2 with 18 abst. Proposal 008a passed 38 – 1 with 18 abst. Proposal 008b passed 32 – 6 with 19 abst. Proposal 010 passed 33 – 7 with 17 abst. Proposal 016 passed 33 – 4 with 20 abst. Proposal 036 is very important for players. It will increase the number of available Norm tournaments including new Norm events for CCM & CCE. I believe these tournaments will be very popular. However, the proposer had not considered the impact on players who finish 1st to 3rd in National tournaments who, under current rules, qualify for Master Norm. A big discussion! Eventually passed 28 – 6 with 23 abst. The change to IM Norm tournaments will be delayed slightly until the above problem is sorted out. But the new GM Norm, SIM Norm, CCM Norm & CCE Norm tournaments will be available from January 1, 2019. Entry fees still to be determined by FD. Proposal 022 – another big discussion about gender tournaments. Proposal failed 12 – 24 with 21 abst. Proposal 023 failed 13 – 26 with 17 abst, because the proposal sought to remove the possibility of 10 completed games before viewing, which is not popular with stronger players. Proposal 26 passed 38 – 3 with 16 abst. The Congress session closed at 17:55, then re-opened again at 18:10 for the European Zonal meeting. Andrey Pavlikov (RUS) chaired this meeting as European Zonal Director and presented his report with comments on ongoing tournaments. Zonal FD Report accepted. It was agreed that the number of qualifiers from European Postal Semi-finals be reduced from two to one. Delegates were also invited to find out how many players over 2400 would be prepared to play in a strong postal tournament. Agreed to provide 5000 euros additional help to ICCF Services Committee. Agreed to provide 2000 euros to 2019 Congress organisers. 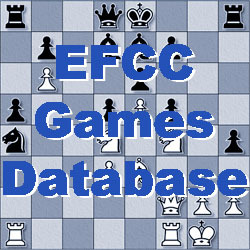 There will be new European tournaments: 4-player Team tournaments for players U-2200 and U-1900; new Chess 960 European tournaments; and a new Cup tournament for players rated below 2000. The meeting closed at 19:20. Commenced (after the Introductions) with the Medal ceremony. Gary Maguire collected his CCE & CCM Medals/Certificates in person. On behalf of EFCC I collected medals/certificates for everyone else who earned medals since last Congress. The ICCF Minutes for the 2017 Congress were debated but, in spite of our objections, the Minutes were passed by 25 - 4 with 27 abstentions. Mexico were proposed as a new ICCF Federation & accepted. ICCF currently have problems obtaining annual membership fees from Argentina, Turkey, Hong Kong & Cape Verde: these Federations risk suspension & eventual expulsion from ICCF. The Financial Accounts were debated - seen on screen only. Existing Auditor not happy - he resigned shortly before Congress. The Accounts were only approved 13 - 2 with 42 abstentions, Generally, delegates were uneasy with the new FD methodology. A new Auditor was proposed: Paul Scott of Wales. ICCF Accounts - a loss of 7614 euros during 2017 and ICCF currently have 213628 euros in reserve. The financial plan is to project a loss of 10k annually for next 4-5 years. Plenty of money in reserve. There is a possibility that ICCF may have to pay VAT at some point in the future. Proposal 29 was contentious. Defeated by 17 - 22 (18 abstentions), Very close. Proposal 30 passed by 37-1 (19 abstentions). Proposal 27 - global tendering failed 6-30 (21 abst) after considerable discussion. Day 1 closed at 18:05 and we are already behind schedule. It is my sad news to report the death of English CC player David Coyne at the age of 73. David had been diagnosed with COPD in 2005 which recently turned to pneumonia. Our sympathies & condolences to his family & friends. RIP. If you have no strong feelings on a particular proposal, then please do not concern yourself. My own experiences tell me that, during the actual debate at Congress, you often hear points brought forward that we had not previously thought of. And this new information can often change your view on a proposal. I will therefore decide which way to vote after hearing the debate at Congress. However, if you strongly feel that EFCC should be voting Yes or No to a particular proposal, and you can tell me why you feel that way, please let me know before the end of July. If a majority is in favour of proceeding a particular way, then I will vote online before Congress in accordance with the majority. In what is likely to be regarded as one of the team's finest performances, I'm pleased to say that with just one game remaining (Tleptsok vs Hall, which is one of the promotion games on ICCF.com) England have defeated the Russian team in the 2016 friendly rated match. The score is currently 47-36, so it is a convincing win, with many fine individual performances. Later this year, England will face an even bigger challenge and I will be contacting many players in the Summer to select a large team and give more information regarding the opposition. Highly recommended! Chess books specifically concerning correspondence chess are quite rare. Even rarer are game collections by specialist CC players, so this book is a very welcome addition to this list. Mike Read was born in 1960 & was a strong junior chess player OTB in the 1970’s. 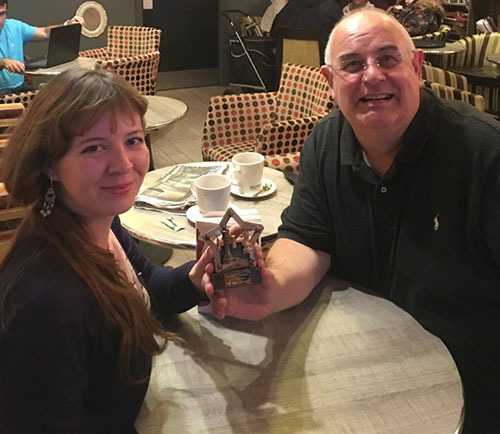 It was in the late 70’s and early 80’s that Mike began to specialise in correspondence chess and this game collection covers games from 1978 to 2000, at which time Mike was forced to abandon competitive chess due to health issues. Mike was a very strong player! He earned the ICCF Senior International Master Title & had an ICCF rating of 2571 at its best. All this without ever owning a computer or using one during his games. So this collection is very special as all the annotations come from Mike’s own brain, and his thoughts at the time. This is a thick book! Over 500 pages for only a little over £10 is an excellent bargain at a time when most new chess books are £20 or thereabouts. The introduction lasts only four pages & there then follows a one page summary of his results in his competitive CC career. The rest of the book is jam-packed with games & annotations. The quality and strength of his opponents grew as his career progressed and the book is laid out chronologically, so you will find the strongest opponents in the latter half of the book. Having said that, I really enjoyed playing some his early games where tactics abound! Some of these early opponents are still playing BCCA chess today such as Peter Tibbert, Iain Gould & Peter Coast. His later opponents include GM Tonu Tiits of Estonia, GM Matthias Rufenacht of Switzerland (still active & playing today) and GM (and World Champion) Joop van Oosterom of the Netherlands. This book is strongly recommended for all players of all strengths, whether correspondence chess players or not. You cannot fail to learn from the quality of Mike’s annotations. ICCF has a Code of Conduct & Disciplinary procedure to help deal with players who default or behave badly and this has worked well for them. So EFCC has adopted a similar policy which can be seen in the left-hand menu under "EFCC" - "Code of Conduct" (Or click here). This will allow EFCC to deal with situations arising in its own tournaments, or when players represent England in Team tournaments or Friendly Matches. The vast majority of players never default or behave badly! It is just a very small minority whom we need to address. 1st stage entries are now being accepted for the 11th ICCF Veterans' World Cup. This event is being organised for the fourth consecutive year by the EFCC, with our President, SIM Ian M Pheby, being the tournament organiser. Entries can be made under 'New events' by ICCF Direct Entry or by paying the entry fee of £9 via PayPal on the left-hand side of this page using 'VWC11' as the reference. Ian M Pheby, Oaklea Cottage, Horsham Road, Capel, Dorking, RH5 5JH. The deadline for submitting entries is 1st August 2018. ICCF Webserver Open tournament in 3 stages. Preliminaries rated only; Semi-finals and Final Title norms possible. and several runner-ups will be promoted to fill vacancies. £10 to be paid at the EFCC website with the reference 'Russian 25' using the 'Online Fee Payment' in the left-hand column of this web page. All EFCC Patrons and representatives of affiliated organisations are welcome to attend. After some very dedicated, hard work I am pleased to announce that LGM Toni Halliwell has been awarded the International Arbiter title by ICCF. Toni will be presented with her medal and certificate at the ICCF Congress in Llandudno in August. With the congress being held on British shores it is a great incentive for other players to work towards their norms and titles in order to be able to take up the offer from our Welsh friends to attend the opening ceremony and the awards presentation. New Year, New Titles ! Steven Cade, David Evans and Jo Wharrier. Well played gentlemen! Wales have succeeded in their bid to host the 2018 ICCF congress. It will take place at the Imperial Hotel in Llandudno in August. The 1st English Championship Preliminary B has finished. Congratulations to Terence Donovan for winning this tournament with the excellent score of 9 out of 10. Terence will receive a prize of £15.00 and is entitled to enter a semi-final of the 2nd ECCC which will start in 2019. Trevor S. Brotherton was second and also undefeated finishing on 8 out of 10, and Sean Clark finished third with 7.5 out of 10. Championship Final – John D. Rhodes and Alan J. C. Rawlings currently lead with 6.5 out of 12, with Stan J. Grayland third on 6.5 out of 13. 36 games remain in this closely fought tournament. Semi-Final A – I. Wes Bell leads with 6 out of 9. Phillip W. Revell is second with 5.5 out of 9, and Kevin J. Thurlow is third with 5 out of 9. 14 games remain. Semi-Final B – Brian Thompson leads with 7 out of 10. Keith Kitson is second with 5.5 out of 9, and Richard Williams is third with 5 out of 8. 12 games remain. 1st English Championship Preliminary A – Robert Marks leads with 8.5 out of 10. Richard I. Clark is second with 7.5 out of 9, and Gregory Hughes is third on 6.5 out of 7. 3 games remain. 1st English Championship Preliminary C – Congratulations to Allan Gardner for winning this tournament with the excellent score of 9 out of 10. Allan will receive a prize of £15.00 and is entitled to enter a semi-final of the 2nd ECCC which will start in 2019. Phil J. Brooks was second and also undefeated finishing on 8.5 out of 10, and Arthur F. Reed finished third with 7.5 out of 10. 1 game remains. The entry fee for the preliminary stage through EFCC, payable via EFCC's website is £7 or players can enter direct with the Peru Federation by following the instructions in the announcement. There is no ICCF direct entry for this tournament. EFCC would like to congratulate both Les Ellis and Paul Batchelor on achieving recent norms to gain their ICCF CCE titles. Praveen Rallabandi has also secured his first IM norm in an ICCF Master norm section and now needs a win in his last game to gain an SIM norm. Well Played Praveen! Very sadly, we have to report the death of CC International Master John Toothill. Our condolences go to friends & family. John’s name may not be familiar to younger players as you have to go back to the 1970’s / 80’s from his CC playing career. In 1972 / 3 he won a British Championship Reserves tournament followed by victory in a Candidates tournament the very next year so advancing to the Final. He came 6th in the Final 1974 / 5 & 2nd in 1975 / 6. But it is on the CC International scene that he is best known, as part of the Great Britain team that won the Gold Medal in the 9th CC Olympiad 1982-87; the first & only time that a British team has won this top CC team event. At the time, this was a fantastic achievement beating the all-conquering Soviet Union team into 3rd place (West Germany were 2nd). John was also a member of the Great Britain team in the 1st European Team Championship Final (1978-81), and a member of the winning England team in the 1st North Atlantic Team tournament (1981-4). He was awarded the CC International Master Title in 1981. John was a strong OTB player playing for Windemere Chess club for over 40 years winning the County Championship on several occasions. There are three excellent annotated games of John’s in Tim Harding’s superb book Correspondence Chess in Britain & Ireland 1924-1987 and he also featured in Grigory Sanakoev’s book World Champion at the 3rd Attempt.